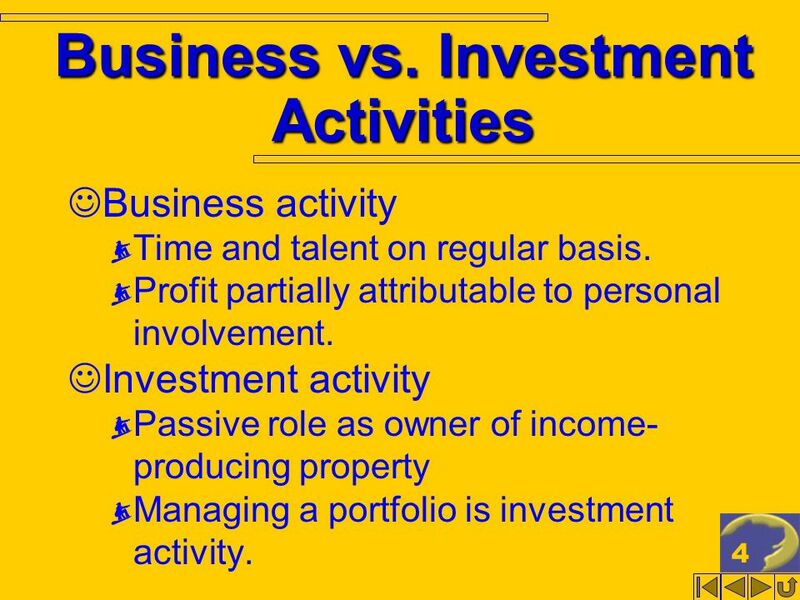 4 4 Business vs. Investment Activities Business activity Time and talent on regular basis. Profit partially attributable to personal involvement. Investment activity Passive role as owner of income- producing property Managing a portfolio is investment activity. 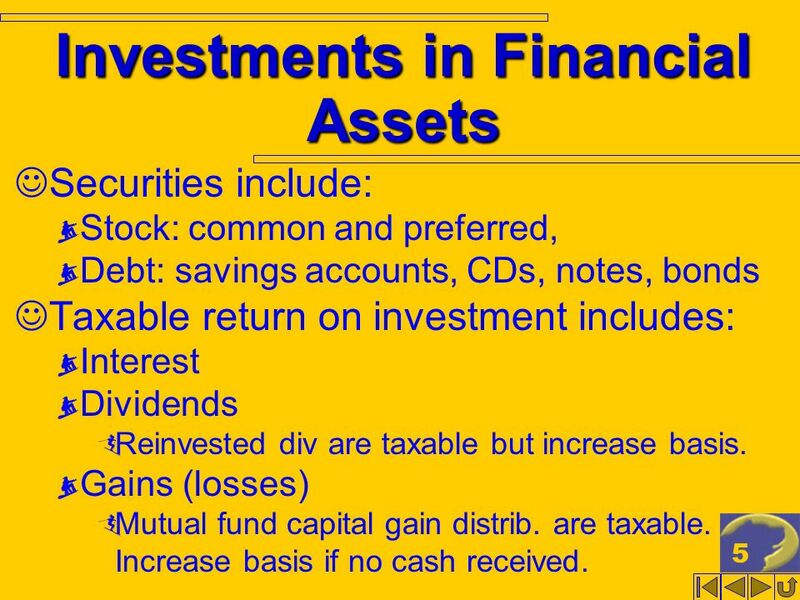 5 5 Investments in Financial Assets Securities include: Stock: common and preferred, Debt: savings accounts, CDs, notes, bonds Taxable return on investment includes: Interest Dividends Reinvested div are taxable but increase basis. 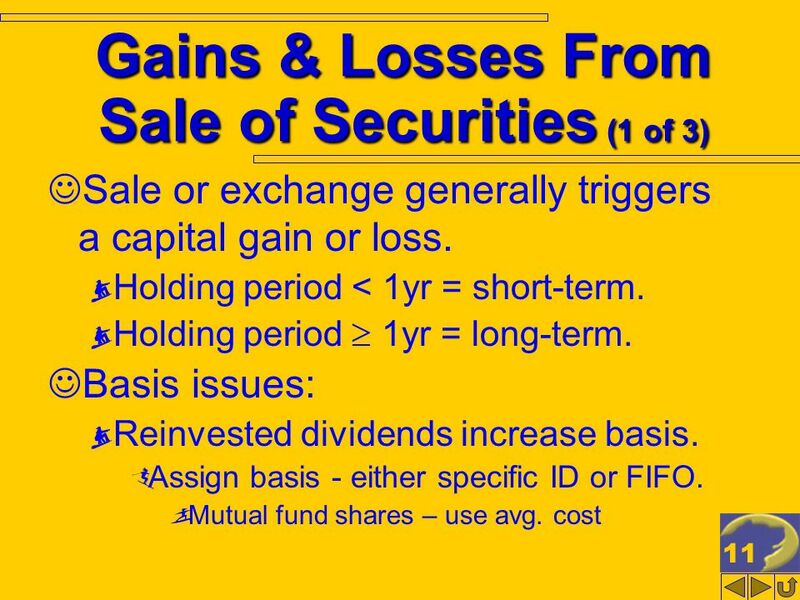 Gains (losses) Mutual fund capital gain distrib. are taxable. Increase basis if no cash received. 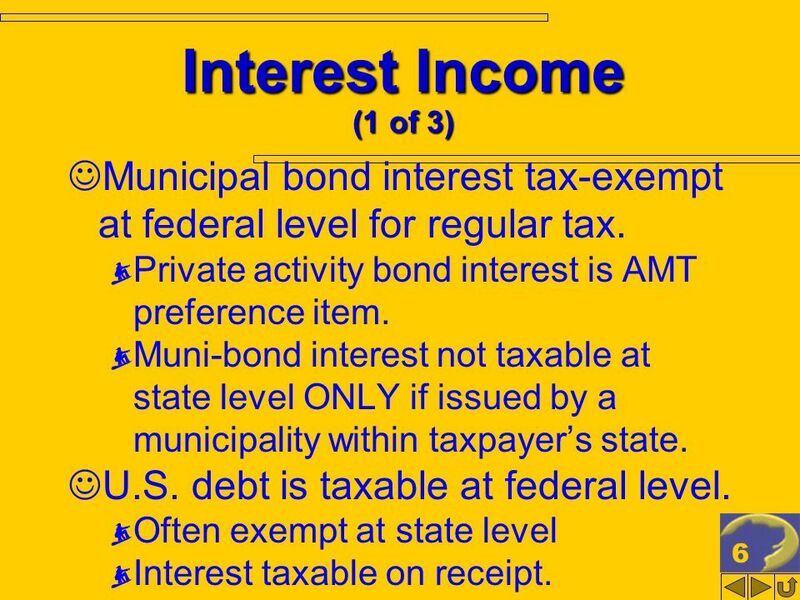 6 6 Interest Income (1 of 3) Municipal bond interest tax-exempt at federal level for regular tax. Private activity bond interest is AMT preference item. Muni-bond interest not taxable at state level ONLY if issued by a municipality within taxpayers state. U.S. debt is taxable at federal level. Often exempt at state level Interest taxable on receipt. 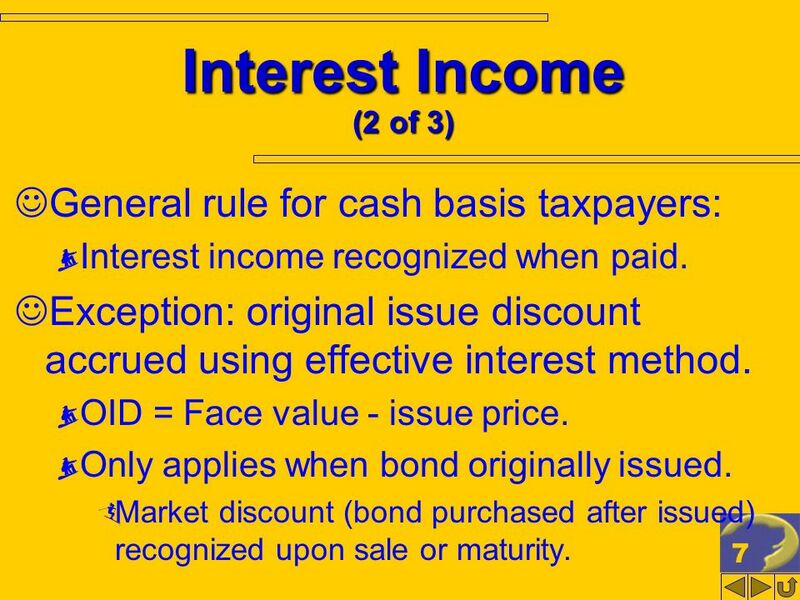 7 7 Interest Income (2 of 3) General rule for cash basis taxpayers: Interest income recognized when paid. Exception: original issue discount accrued using effective interest method. OID = Face value - issue price. Only applies when bond originally issued. Market discount (bond purchased after issued) recognized upon sale or maturity. 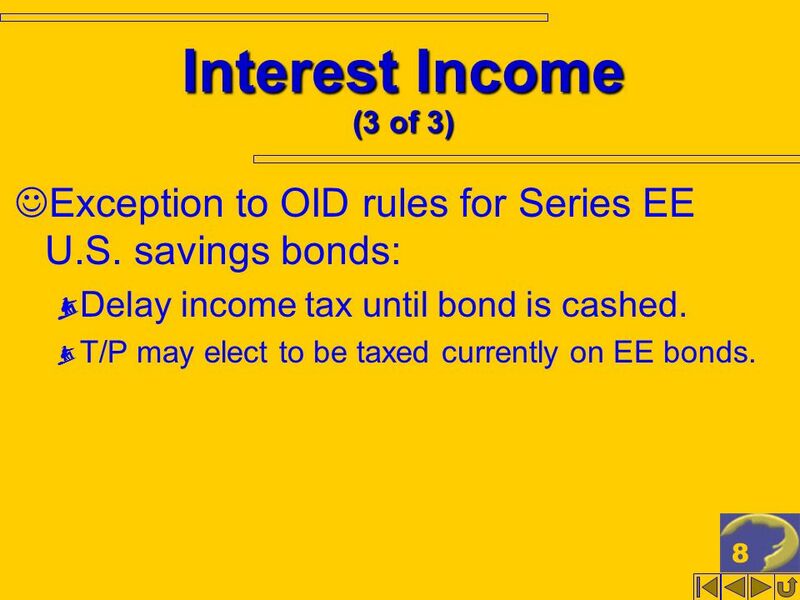 8 8 Interest Income (3 of 3) Exception to OID rules for Series EE U.S. savings bonds: Delay income tax until bond is cashed. T/P may elect to be taxed currently on EE bonds. 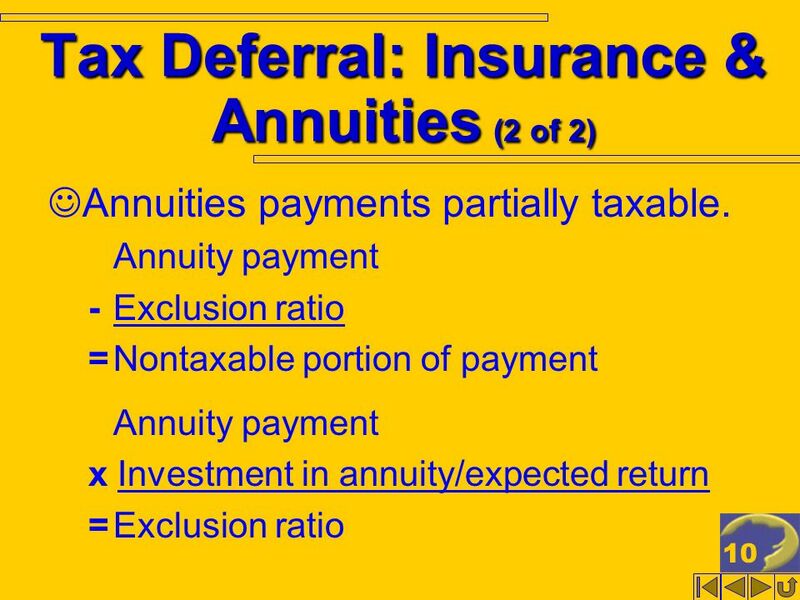 9 9 Tax Deferral: Insurance & Annuities (1 of 2) Life insurance proceeds NOT taxable income to recipient at death. 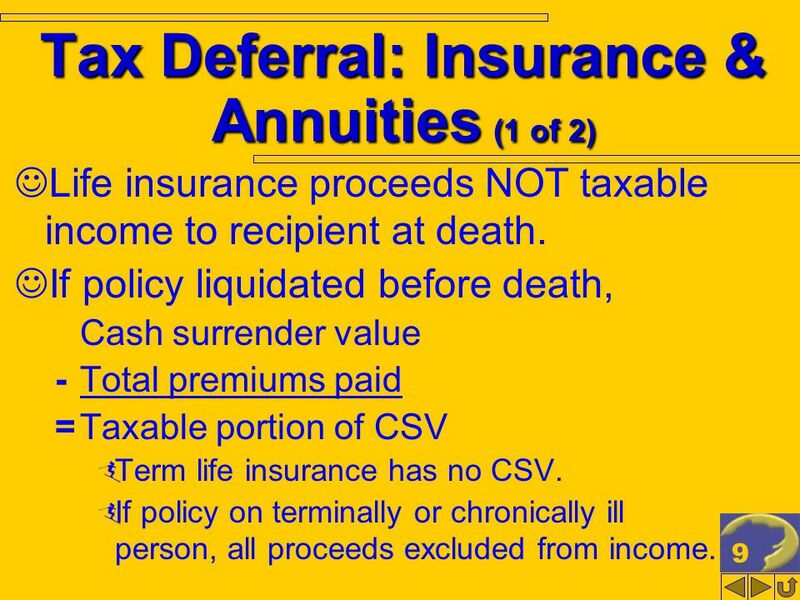 If policy liquidated before death, Cash surrender value -Total premiums paid =Taxable portion of CSV Term life insurance has no CSV. If policy on terminally or chronically ill person, all proceeds excluded from income. 12 12 Gains & Losses From Sale of Securities (2 of 3) Worthless securities Treated as if they are sold on the LAST day of the tax year for $0. Either LTCL or STCL depending on holding period. Nonbusiness bad debts are treated as a short-term capital loss. 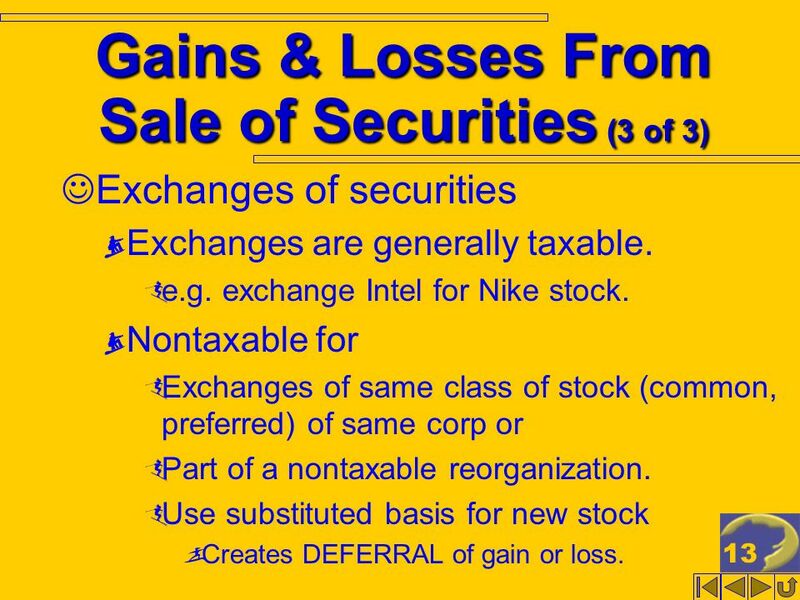 13 13 Gains & Losses From Sale of Securities (3 of 3) Exchanges of securities Exchanges are generally taxable. e.g. exchange Intel for Nike stock. Nontaxable for Exchanges of same class of stock (common, preferred) of same corp or Part of a nontaxable reorganization. Use substituted basis for new stock Creates DEFERRAL of gain or loss. 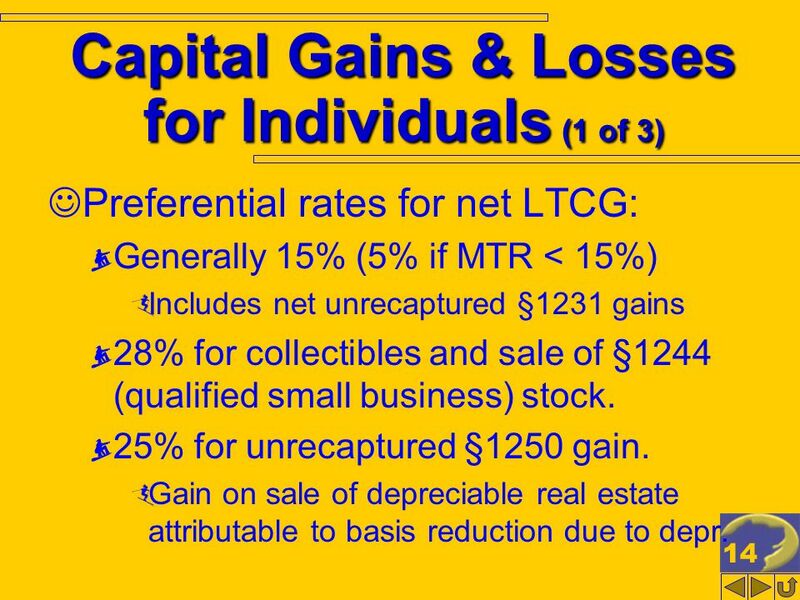 14 14 Capital Gains & Losses for Individuals (1 of 3) Preferential rates for net LTCG: Generally 15% (5% if MTR < 15%) Includes net unrecaptured §1231 gains 28% for collectibles and sale of §1244 (qualified small business) stock. 25% for unrecaptured §1250 gain. Gain on sale of depreciable real estate attributable to basis reduction due to depr. 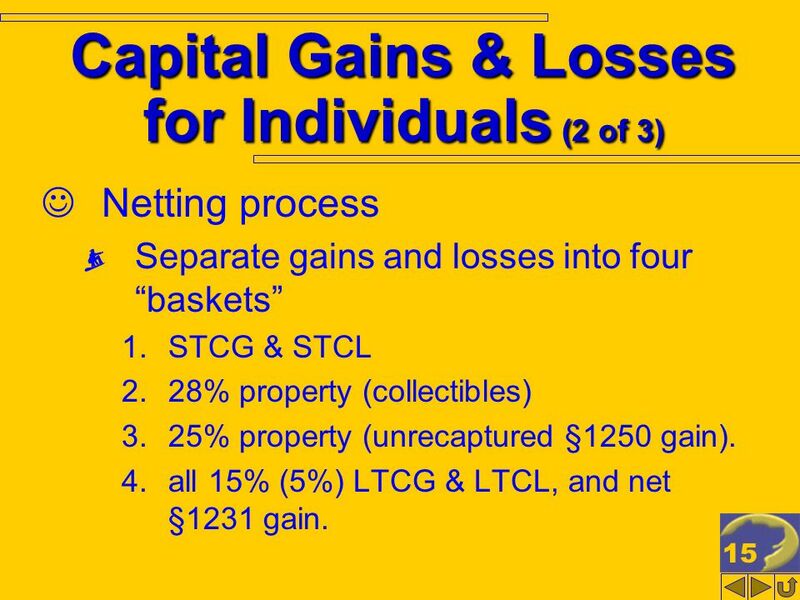 15 15 Capital Gains & Losses for Individuals (2 of 3) Netting process Separate gains and losses into four baskets 1.STCG & STCL 2.28% property (collectibles) 3.25% property (unrecaptured §1250 gain). 4.all 15% (5%) LTCG & LTCL, and net §1231 gain. 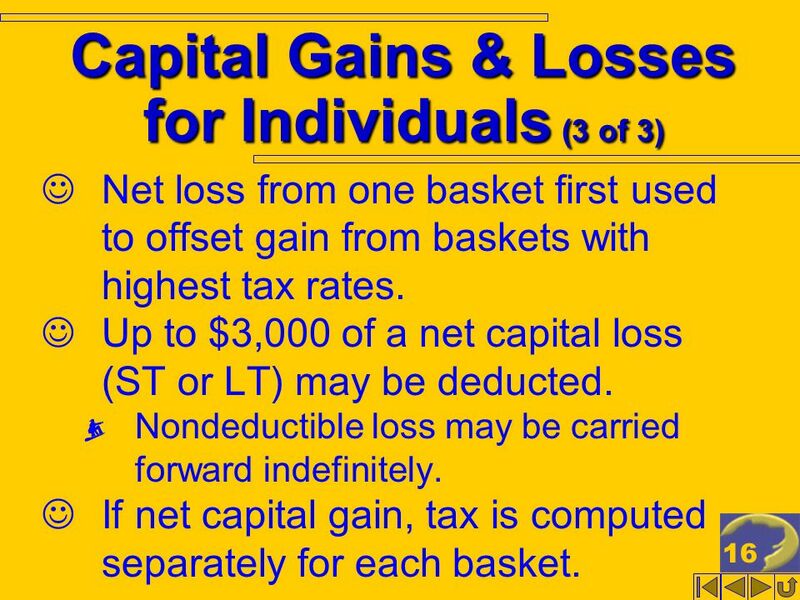 16 16 Capital Gains & Losses for Individuals (3 of 3) Net loss from one basket first used to offset gain from baskets with highest tax rates. 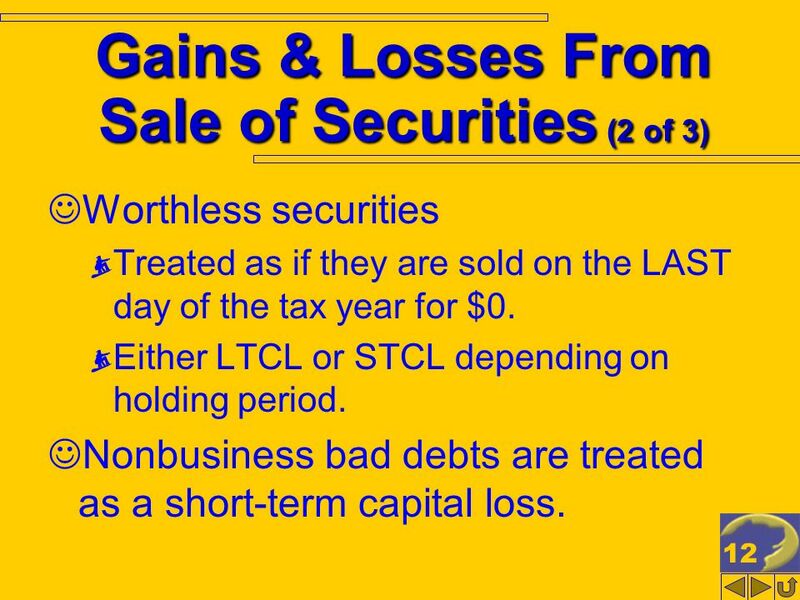 Up to $3,000 of a net capital loss (ST or LT) may be deducted. Nondeductible loss may be carried forward indefinitely. If net capital gain, tax is computed separately for each basket. 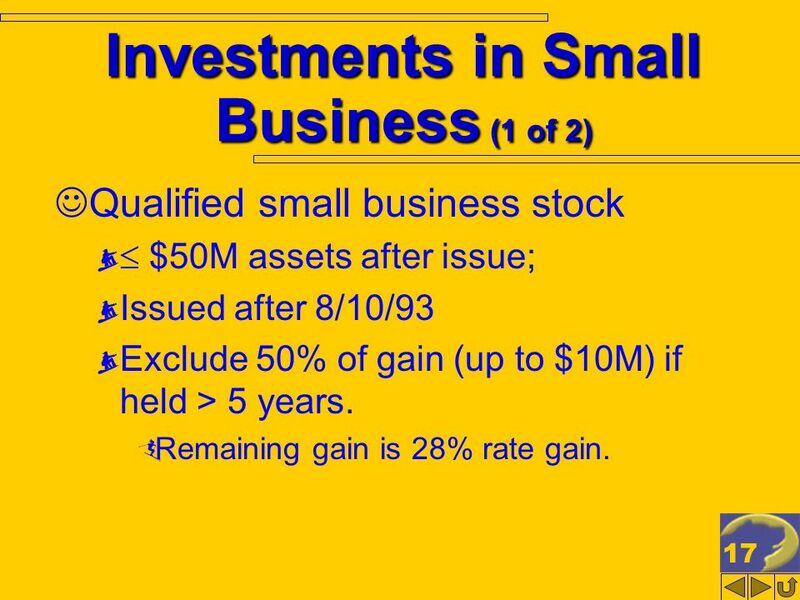 17 17 Investments in Small Business (1 of 2) Qualified small business stock $50M assets after issue; Issued after 8/10/93 Exclude 50% of gain (up to $10M) if held > 5 years. Remaining gain is 28% rate gain. 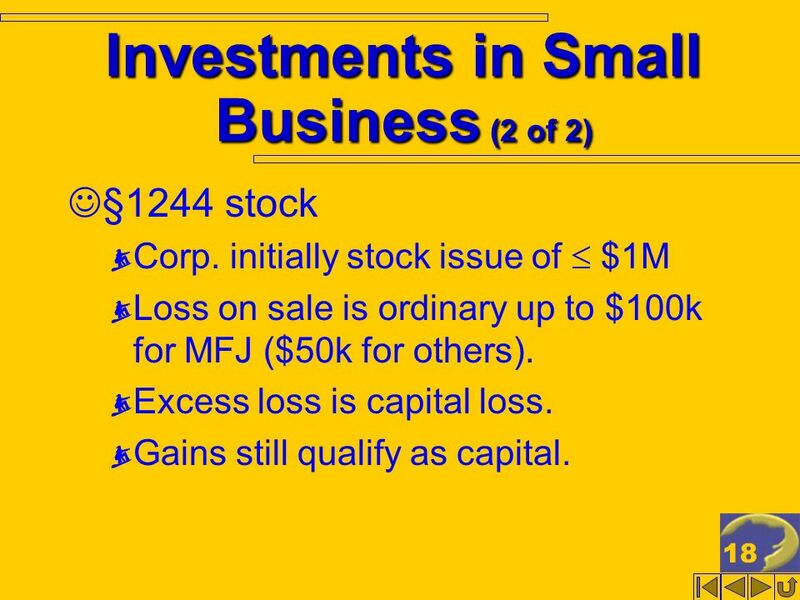 18 18 Investments in Small Business (2 of 2) §1244 stock Corp. initially stock issue of $1M Loss on sale is ordinary up to $100k for MFJ ($50k for others). Excess loss is capital loss. Gains still qualify as capital. 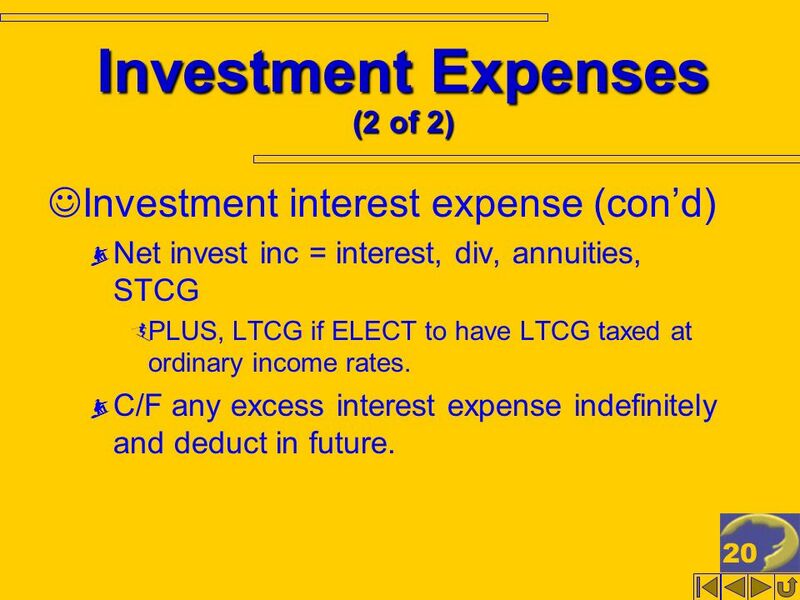 20 20 Investment Expenses (2 of 2) Investment interest expense (cond) Net invest inc = interest, div, annuities, STCG PLUS, LTCG if ELECT to have LTCG taxed at ordinary income rates. C/F any excess interest expense indefinitely and deduct in future. 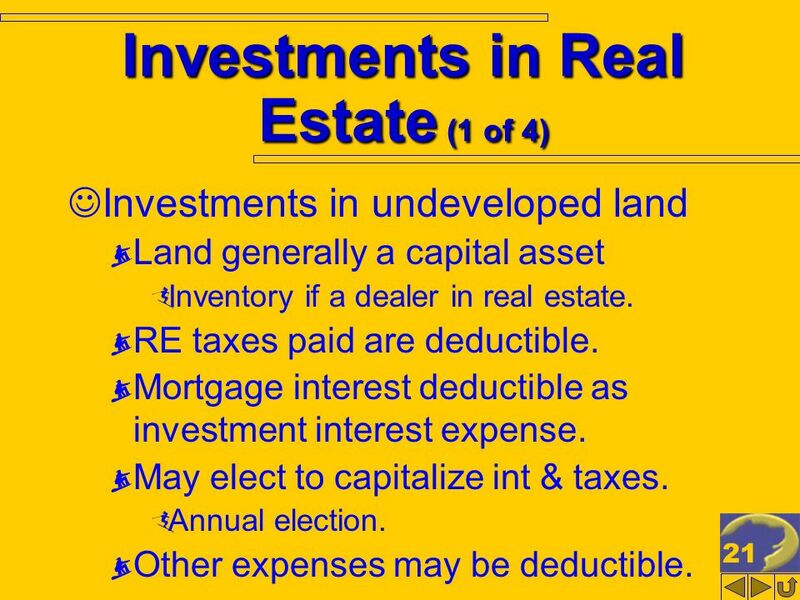 21 21 Investments in Real Estate (1 of 4) Investments in undeveloped land Land generally a capital asset Inventory if a dealer in real estate. RE taxes paid are deductible. 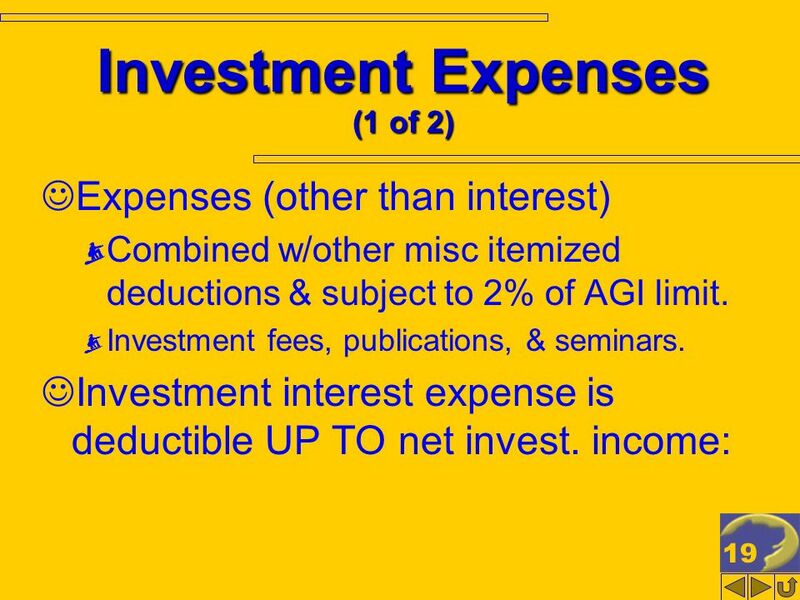 Mortgage interest deductible as investment interest expense. May elect to capitalize int & taxes. Annual election. Other expenses may be deductible. 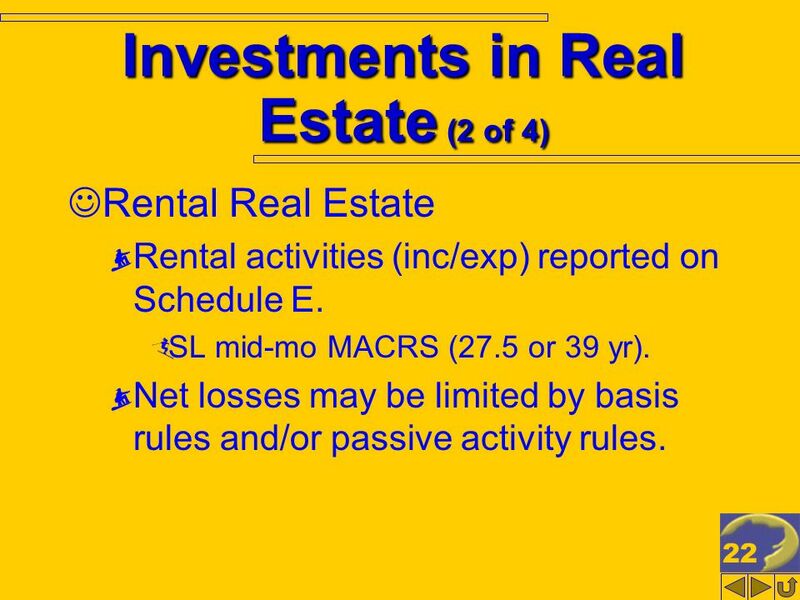 22 22 Investments in Real Estate (2 of 4) Rental Real Estate Rental activities (inc/exp) reported on Schedule E. SL mid-mo MACRS (27.5 or 39 yr). Net losses may be limited by basis rules and/or passive activity rules. 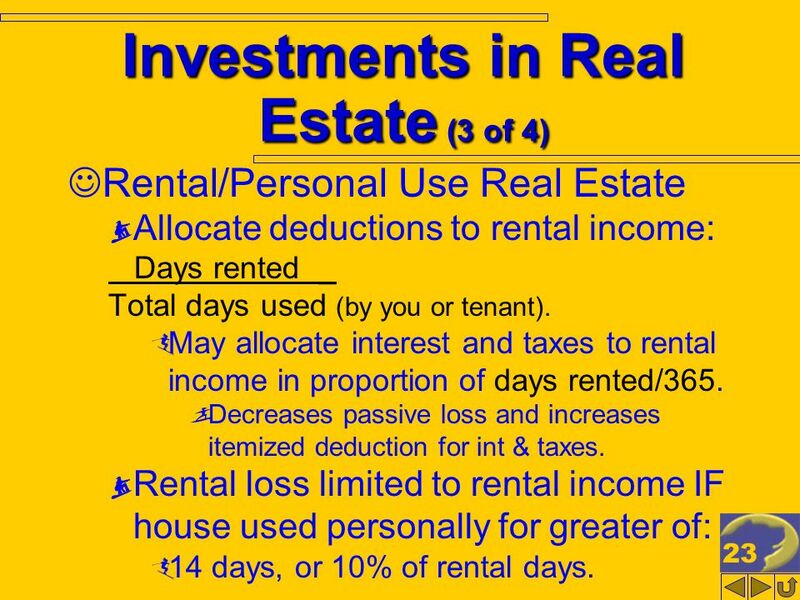 23 23 Investments in Real Estate (3 of 4) Rental/Personal Use Real Estate Allocate deductions to rental income: Days rented _ Total days used (by you or tenant). May allocate interest and taxes to rental income in proportion of days rented/365. Decreases passive loss and increases itemized deduction for int & taxes. Rental loss limited to rental income IF house used personally for greater of: 14 days, or 10% of rental days. 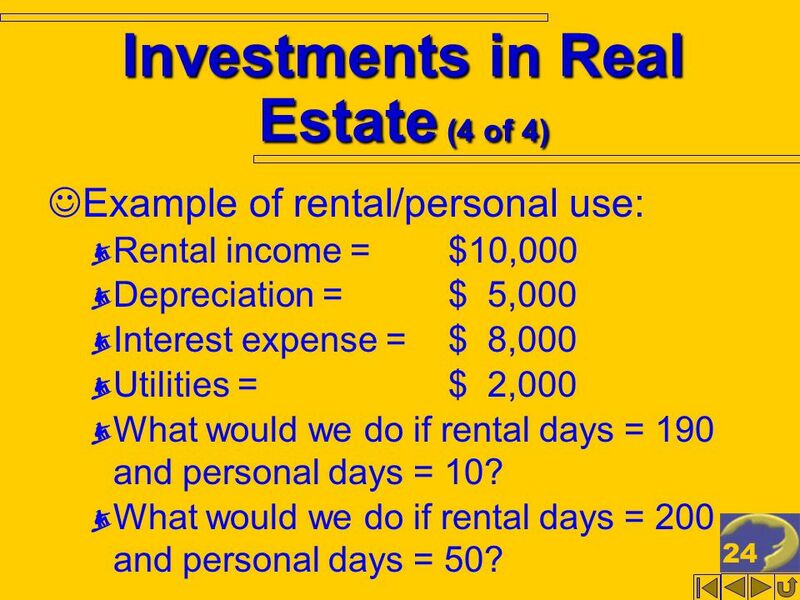 24 24 Investments in Real Estate (4 of 4) Example of rental/personal use: Rental income =$10,000 Depreciation = $ 5,000 Interest expense = $ 8,000 Utilities = $ 2,000 What would we do if rental days = 190 and personal days = 10? What would we do if rental days = 200 and personal days = 50? 25 25 Passive Losses (1 of 4) Sec. 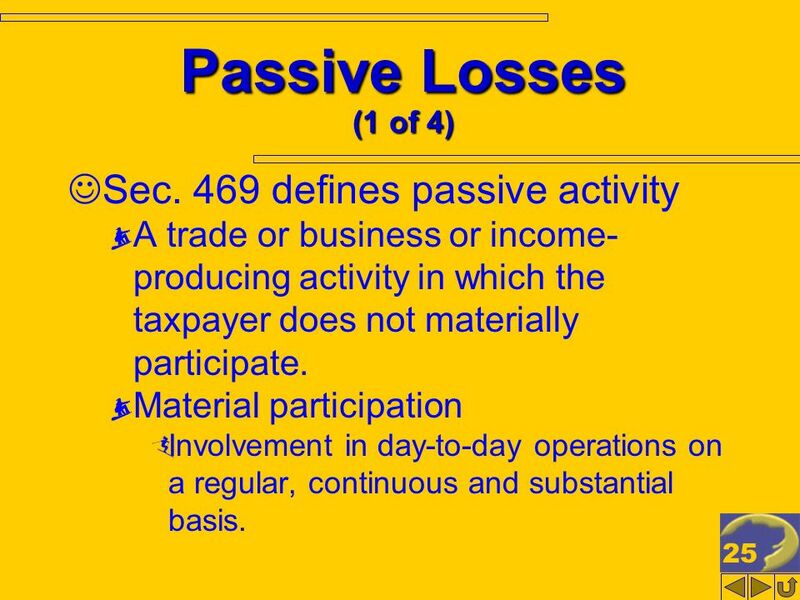 469 defines passive activity A trade or business or income- producing activity in which the taxpayer does not materially participate. Material participation Involvement in day-to-day operations on a regular, continuous and substantial basis. 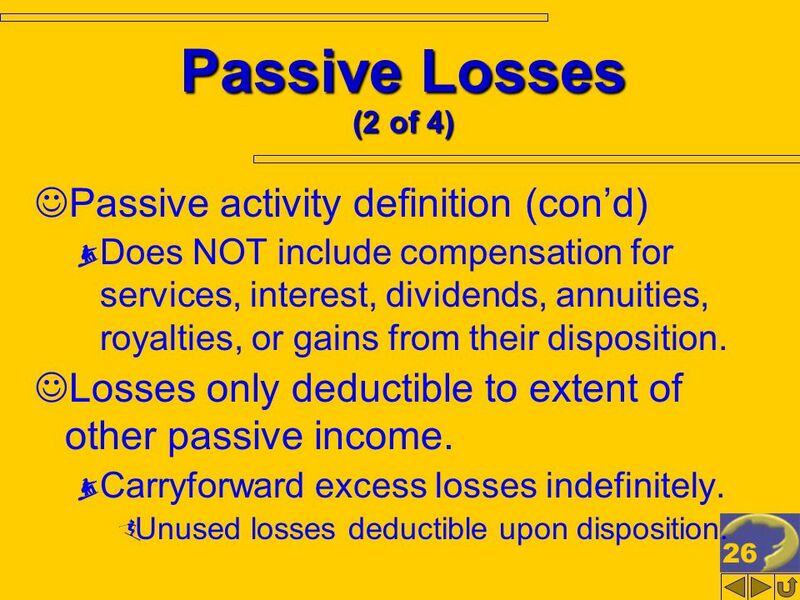 26 26 Passive Losses (2 of 4) Passive activity definition (cond) Does NOT include compensation for services, interest, dividends, annuities, royalties, or gains from their disposition. Losses only deductible to extent of other passive income. Carryforward excess losses indefinitely. Unused losses deductible upon disposition. 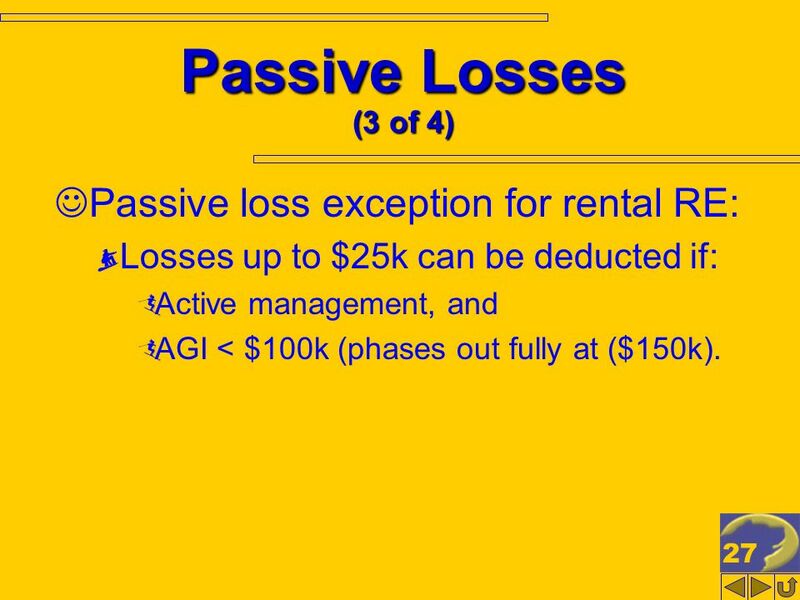 27 27 Passive Losses (3 of 4) Passive loss exception for rental RE: Losses up to $25k can be deducted if: Active management, and AGI < $100k (phases out fully at ($150k). 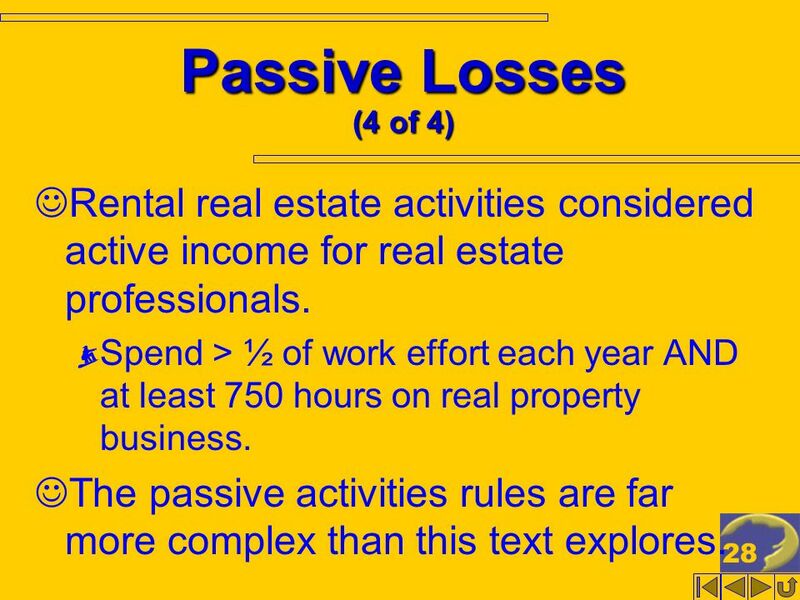 28 28 Passive Losses (4 of 4) Rental real estate activities considered active income for real estate professionals. Spend > ½ of work effort each year AND at least 750 hours on real property business. The passive activities rules are far more complex than this text explores. 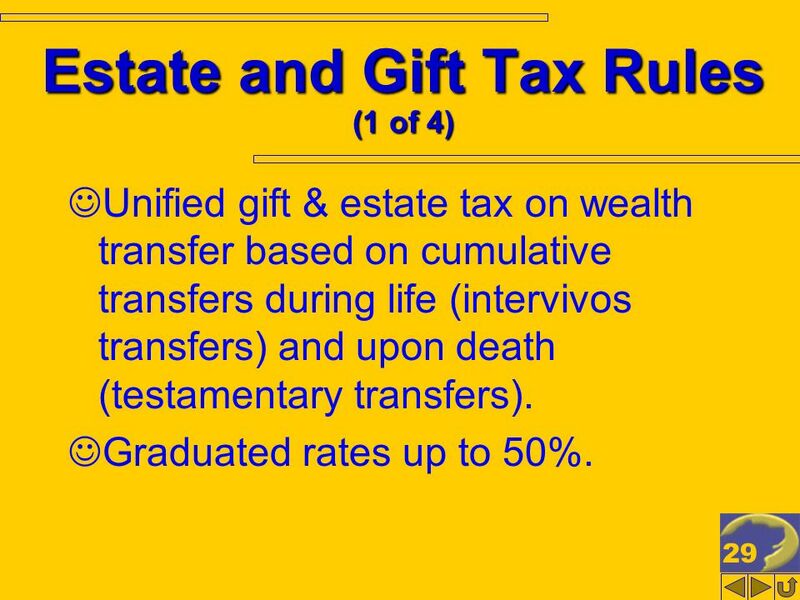 29 29 Estate and Gift Tax Rules (1 of 4) Unified gift & estate tax on wealth transfer based on cumulative transfers during life (intervivos transfers) and upon death (testamentary transfers). Graduated rates up to 50%. 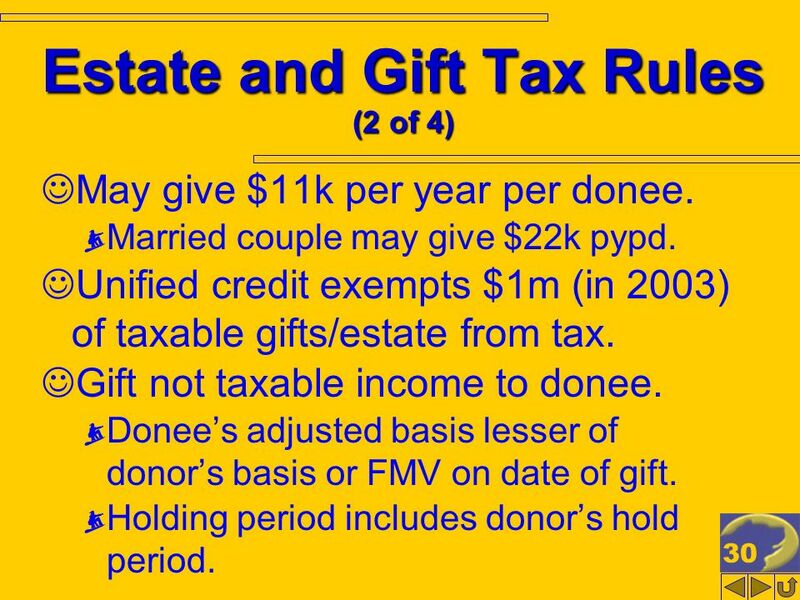 30 30 Estate and Gift Tax Rules (2 of 4) May give $11k per year per donee. Married couple may give $22k pypd. Unified credit exempts $1m (in 2003) of taxable gifts/estate from tax. Gift not taxable income to donee. Donees adjusted basis lesser of donors basis or FMV on date of gift. Holding period includes donors hold period. 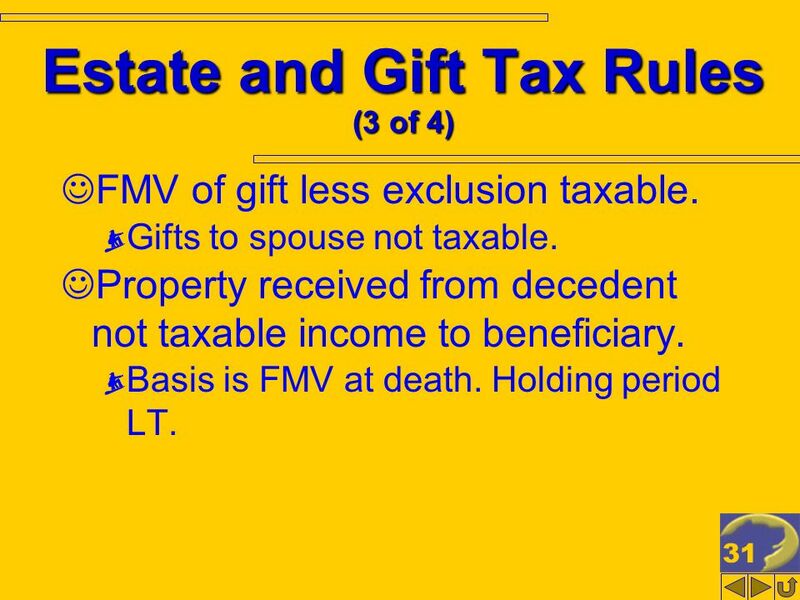 31 31 Estate and Gift Tax Rules (3 of 4) FMV of gift less exclusion taxable. Gifts to spouse not taxable. Property received from decedent not taxable income to beneficiary. Basis is FMV at death. 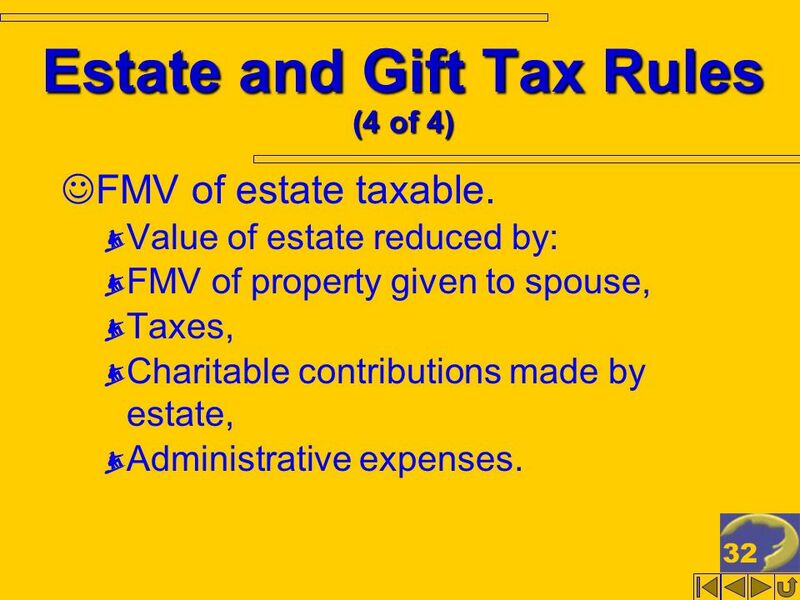 Holding period LT.
32 32 Estate and Gift Tax Rules (4 of 4) FMV of estate taxable. Value of estate reduced by: FMV of property given to spouse, Taxes, Charitable contributions made by estate, Administrative expenses. 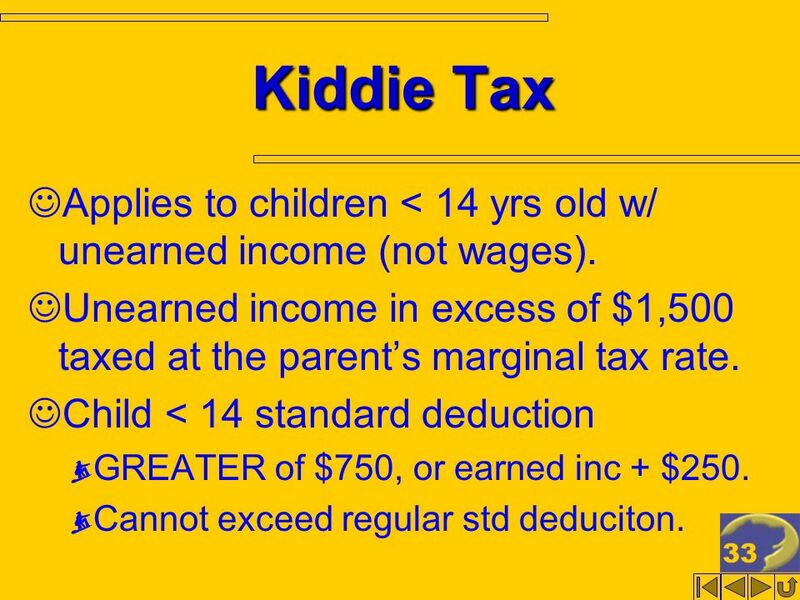 33 33 Kiddie Tax Applies to children < 14 yrs old w/ unearned income (not wages). Unearned income in excess of $1,500 taxed at the parents marginal tax rate. Child < 14 standard deduction GREATER of $750, or earned inc + $250. Cannot exceed regular std deduciton. Download ppt "1. 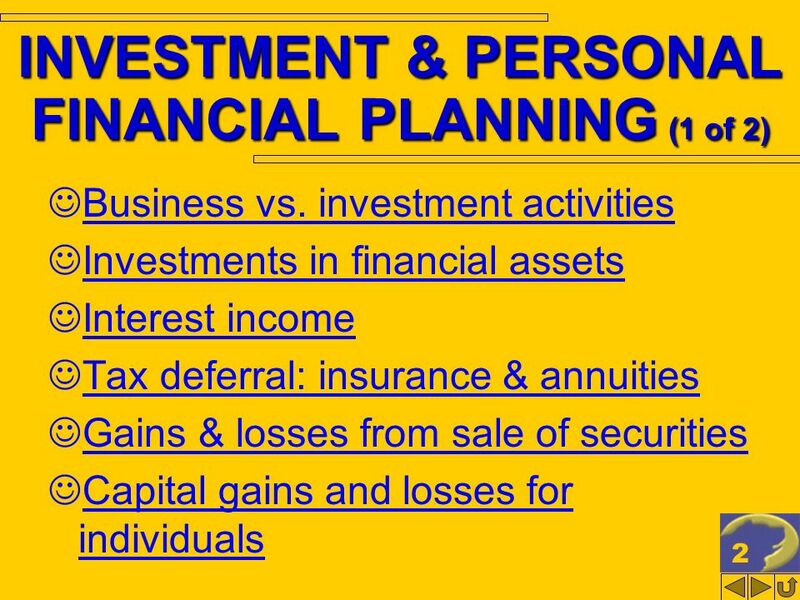 2 INVESTMENT & PERSONAL FINANCIAL PLANNING (1 of 2) Business vs. investment activities Investments in financial assets Interest income Tax deferral:"
1. 2 THE INDIVIDUAL TAX FORMULA Corporate vs. individual tax model Filing status for individuals Overview of taxable income Alternative minimum tax Payment. COMPENSATION & RETIRMENT PLANNING Employee vs. independent contractor Salaries Employee fringe benefits Employee stock options Employment-related. Chapter 39 Like Kind Exchanges. 12-1 ©2011 Pearson Education, Inc. Publishing as Prentice Hall. McGraw-Hill/Irwin © 2007 The McGraw-Hill Companies, Inc., All Rights Reserved. Chapter 1 Chapter 17 Tax Consequences of Personal Activities McGraw-Hill/Irwin. Copyright © 2008 Pearson Addison-Wesley. All rights reserved. 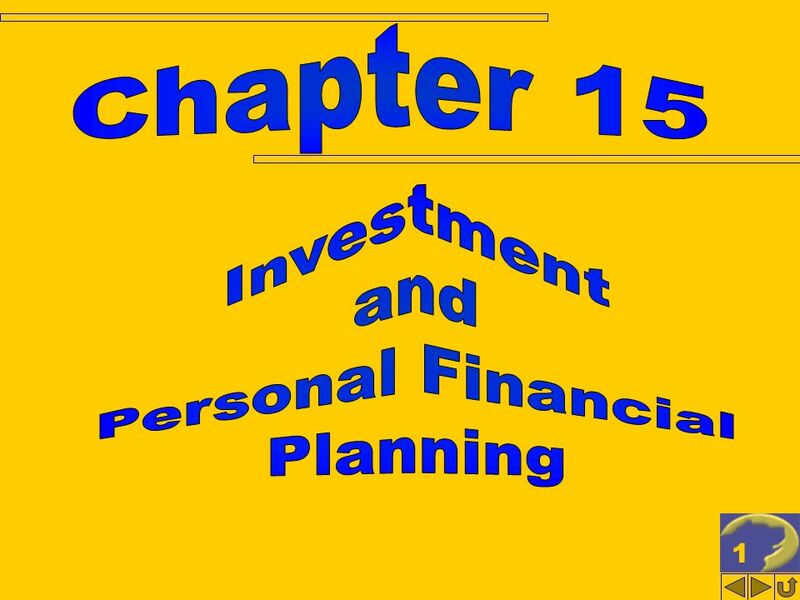 Chapter 14 Annuities and Individual Retirement Accounts. 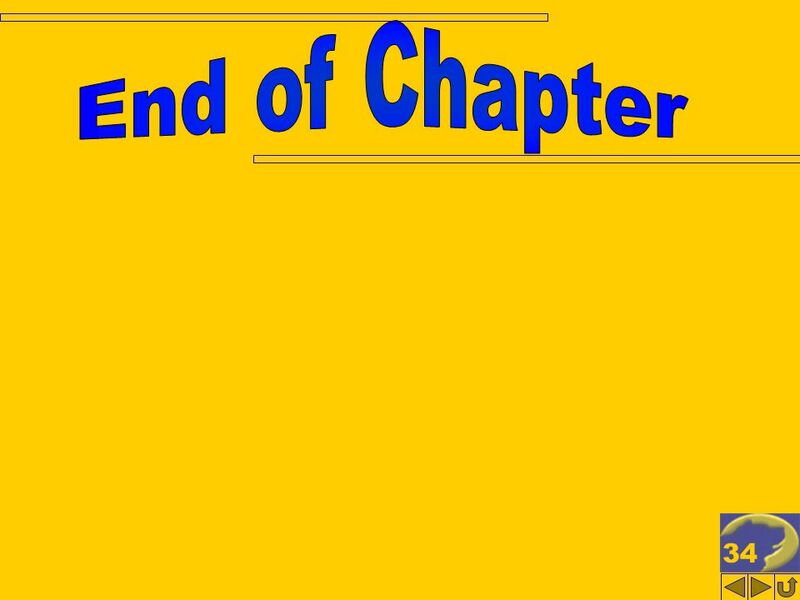 Chapter 8 Losses and Bad Debts. Learning Objectives Identify transactions that may result in losses Determine the proper classification for losses Calculate. ©The McGraw-Hill Companies, Inc. 2008McGraw-Hill/Irwin Chapter 7 Capital Gains and Other Sales of Property “If a client asks in any but an extreme case. 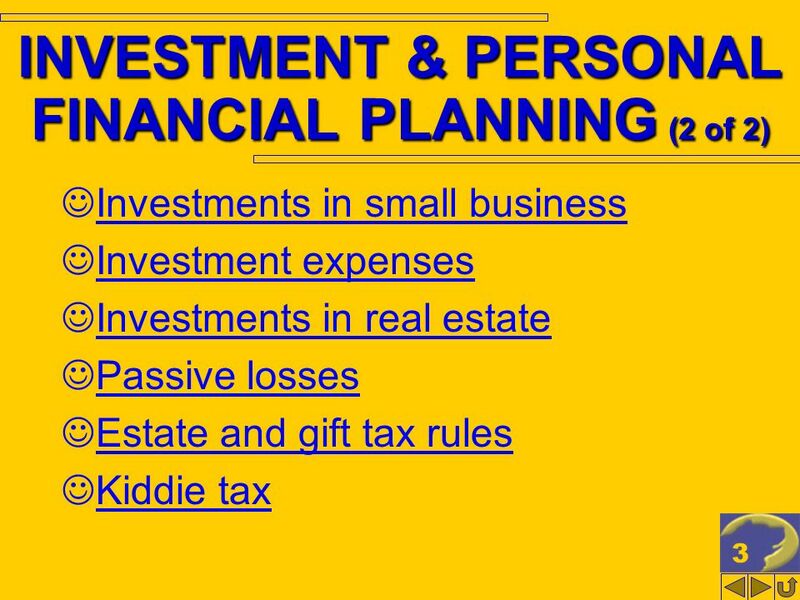 Irwin/McGraw-Hill ©The McGraw-Hill Companies, Inc., 2000 Principles of Taxation Chapter 15 Investment and Personal Financial Planning. 7 - 1 ©2004 Prentice Hall, Inc. Property Dispositions Chapter 7. Income Tax Fundamentals 2010 Gerald E. Whittenburg & Martha Altus-Buller Student’s Copy 2010 Cengage Learning. ©The McGraw-Hill Companies, Inc. 2008McGraw-Hill/Irwin Copyright © 2014 McGraw-Hill Education. All rights reserved. No reproduction or distribution without. 5-1 ©2011 Pearson Education, Inc. Publishing as Prentice Hall. Irwin/McGraw-Hill ©The McGraw-Hill Companies, Inc., 2000 Principles of Taxation Chapter 7 Property Dispositions. Income Tax Fundamentals 2009 Gerald E. Whittenburg & Martha Altus-Buller Student’s Copy 2009 Cengage Learning. Module 14 Transactions Between a Corporation and Its Shareholders. 11. 22 COMPENSATION & RETIRMENT PLANNING Employee vs. independent contractor Salaries Employee fringe benefits Employee stock options Employment-related.